Here you will find a list of our upcoming, current and past events that we're running or are involved with. Events such as our large LAN events, small social gatherings and other happenings will be posted here when they are announced. You know what? We're close to actually doing another one of these things. Rest assured, it'll be something and that something will be awesome. We're back! And in a newly refurbished Union Hall! Come join us and 400+ other gamers in a fun-filled weekend of tournaments and general (and specific) shenanigans! LET THE GAMES BEGIN! CS:GO 5v5 cash prizes, League of Legends, almost everything else! We're back for 2016 with our first event - Respawn LAN 34.5. 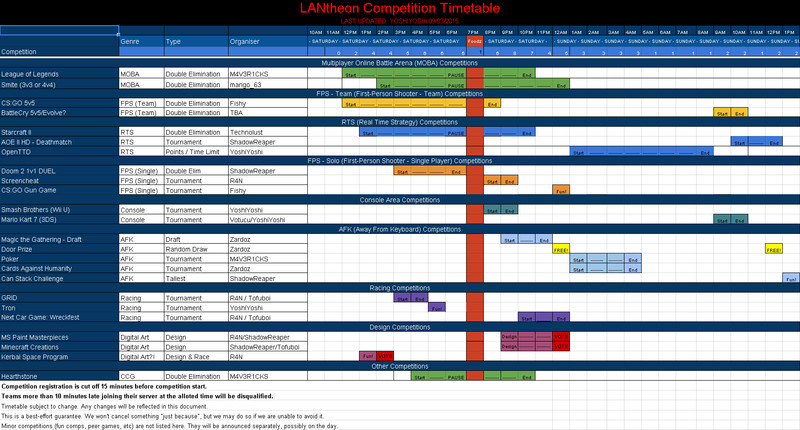 As our regular, larger venue is unavailable for refurbishment, we're going to ease in to the 2016 event calendar with a smaller, yet just as awesome fun-filled weekend of LAN! Respawn LAN v34: Duck Season! That's right! 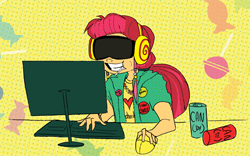 After a successful event in April, we're back in to deliver a massive LAN party all weekend! Time to dust off that PC (perhaps throw in a few upgrades while you're at it) and come down for a fun-filled weekend of gaming! That's right! After a hiatus that was longer than anticipated, we're back in five weeks time to deliver a massive LAN party all weekend! Time to dust off that PC (perhaps throw in a few upgrades while you're at it) and come down for a fun-filled weekend of gaming! And yes, we're right at the start of the academic holiday period. THERE IS NO EXCUSE. Tournaments, activities, ALL THE THINGS! A SPECIAL EVENT! We haven't got our venue back till June, so we're doing a half-size event to tide us over because there's heaps of things we'd love to do and we're feeling a very big itch to do them. Our last event for the year! 425 gamers gather under the same roof for a full weekend of fun and games.. literally. We'll see the return of our usual flagship lineup including CS:GO, DOTA 2, TF2, Starcraft II, League of Legends, Flatout 2, DOOM 2 and more! Respawn LAN v31: Winter WonderLAN! Winter is coming and so is a 425 player BYO PC LAN party! Games, $5500 of cash prizes thanks to GIGABYTE and NVIDIA. Prepaid registrations only for now, we will open general registrations closer to the vent. We've been running events for eight years. Given it's our 30th event, we've decided to reflect upon all the awesome stuff we've done.. and we'll be bringing back a few old favourites along with our usual modern tournaments. Respawn Special Event: Oldschool LAN! We're dusting off the beige boxes and heading back into the pre-2002 gaming era! Counter-Strike beta 7, Warcraft 2, QuakeWorld 1v1 duel, Quake III Arena, QuakeWorld Team Fortress, Starsiege Tribes, Total Annihilation, DOOM 2 and more! Respawn LAN v29: Hack The Planet! We're back after a long-earned break to start off the biggest and best year that Respawn has ever seen with Respawn LAN v29: Hack The Planet. Respawn LAN v28: A Throne of Games! We're back! After a short break from PAX, we'll be itching and ready to LAN! Bringing you your favourite games - DOTA2, League of Legends, CS:GO, CS:S Gungame, Flatout 2, Starcraft II, Team Fortress 2 and wondering why everything seems to have a '2' at the end! 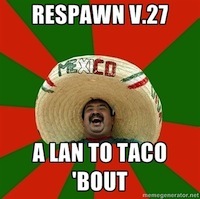 Respawn LAN 27: A LAN to taco 'bout! Respawn LAN once again returns to energise Union Hall with our enterprise-grade network, competitions, give-aways and awesome. We once again return to DOTA2, League of Legends, CS:GO, CS:S Gungame, Flatout 2, Starcraft II, Team Fortress 2 and practically anything else with a 2 it that has enough demand. Respawn LAN v25: construction zone! Introducing Respawn LAN's 25th event. We're proud to announce the SteelSeries CS:GO Challenge, a 5v5 tournament where the first prize will be $1000 cash for the winning team. Thanks to Western Digital and CyberGamer, we are also bringing a $1500 prize pool - $1000 for first place, $500 for second place. So we're having a small one this time. 145 (we dropped player count so that we're not too sardines-ish) players, nice and exclusive and some awesome firsts for Respawn LAN to be announced in the upcoming few days. Prepay restriction has been lifted! 20th event: LEGO is awesome! Usual comps, usual place, USUAL AWESOMENESS! From the depths of the Respawn LAN admin and gopher team, we bring you yet another two action packed days of BYPC LAN gaming and awesomeness! See the front page! This is our BIGGEST EVENT EVER! With more WIN and GOLD than the Chinese Olympic athletes comes RESPAWN LAN V9! SV_MAXPLAYERS is set at 170 350 and registration is MANDATORY. CONFIRMATIONS will be REQUIRED a week before the event - don't be the clown and be denied entry in front of your friends! register NOW for great success! Respawn LAN returns once again, in 8-bit! Escape from the modern computing world as we re-visit the old era, when games were glorious, noobs were unheard of and gameplay, not graphics, were king! 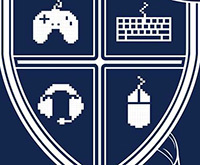 Once again, the Respawn team are bringing you yet another installment of Melbourne's finest BYOPC LAN gaming. We haven't decided on the theme for this one yet so we're wanting to hear from you, our favorite community, as to what you would like. And will be joined by a Team Fotress 2 competition by POPULAR DEMAND. Also returning will be our hard drive throwing, console gaming and more! Back again to fill the void between large events, The Respawn LAN team is proud to present Respawn LAN 5.5! CS Source 5v5, Warcraft III 1v1 and 5v5 DOTA, hard drive throwing and more to be announced! Thanks to DFI, ThermalTake, CyberSlam, AMD and The Smart Shop! Once again, Melbourne's premiere LAN event returns for MORE! CS Source 5v5, Warcraft III 1v1 and 5v5 DOTA, hard drive throwing and more to be announced! NGU will be there with XBOX 360s and a Wii or two. Thanks to DFI, ThermalTake, CyberSlam, AMD and The Smart Shop! The big one. Summer LAN! Disco fever! Dress up ;) CS Source 5v5 $750 first prize, $250 DOTA 5v5, Quake 3, hard drive throwing, free BBQ etc. Pizza run (additional charge) will be run on the Saturday. Thanks to DFI, ThermalTake, CyberSlam, AMD and The Smart Shop! Respawn LAN v3: g0t ninja? Respawn LAN v3 continues our tradition of running quality LAN events. The cap is at 400, the game servers are warming, the drinks are cooling and the network is ready to go! What are you waiting for? Respawn LAN v2 was second crack at it. Despite the limit decrase to 400, we had a fantastic turnout and much fun was had by all. Yarr. Thanks to CyberActive and Thermaltake for making this one possible! Respawn LAN v1 was our first event. Sporting a 500 player limit and a prize pool of over $2000, we aim to redefine the LAN as you know it.